Subject served in Long Range Recon Patrols in South East Asia. Left the service to study mystical martial arts with the same Ninja family that produced Storm Shadow. Snake-Eyes was living an ascetic existence alone in the High Sierras with a pet wolf named Timber when he was recruited for the G.I. Joe team. Qualified expert: All NATO and Warsaw Pact small arms, black belt in 12 different fighting styles and highly skilled in the use of edged weapons. "Snake-Eyes was tempered on the anvil of life until he was as dangerous as a razor-edged sword, flailing in the dark. The G.I.Joe team sheathed that sword and harnessed its deadly energy but even they are wont to forget that even within the safety of its scabbard, the blade retains its cutting edge." *Source: Filecard on package. 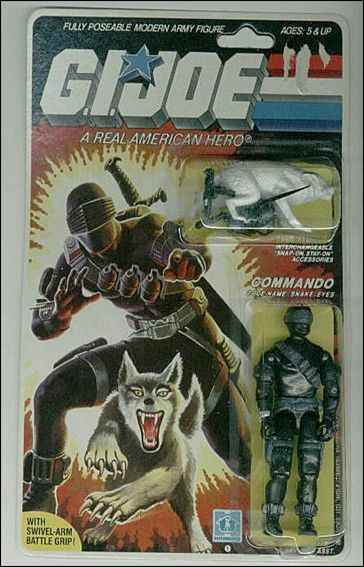 Figure comes with "swivel-arm", a wolf named Timber, accessories and file card on the back of the package.